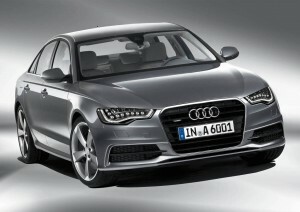 Audi’s new A6 sports a new face, including a huge grille that gives the car a sleek, important look. The cars rear is more simple and conservative. The car boasts strong horizontal lines that contribute to the cars over all visual appeal. The A6 is larger than the competition and has a larger rear cargo area as a result. This car allows the driver to be as involved or as uninvolved as the driver chooses (within reason). Interior quality is exceptional with displays and controls that are impressive and detailed. The cabin generates a very luxurious feel for both driver and passengers. Audi enlarged the overall car, and in doing so created more cabin and boot space. The new A6 is not a mid-size model or an executive barge, it falls somewhere in between. The additional space gives the buyer more for their money, and sets the Audi apart from other executive class vehicles. The Audi A6 offers versatility and gives the buyer a choice of engine preferences. The A6 like other executive class vehicles is an expensive car, but the A6 has managed to keep maintenance costs down. Price-wise, the A6 undercuts most of the competition. Businesses may still be tempted to opt for more economical and tax saving vehicles. The enlargement of the A6 provided much more space in the cargo area. The interior is roomy, but the boot can hold more cargo than many cars in the next class up. This is ideal for luggage and other larger items. The Audi A6 may easily have the most impressive interior design of any other car. The Audi A6 provides fairly basic seating arrangements, but very detailed and elaborate instrumentation. Audi’s attention to detail and precision is evident in the stunning display of instrumentation and illumination in the A6. Just sitting inside the A6 watching the controls and listening to the unique sounds the dials make is a rewarding experience. The A6 is complete with soft executive seats that are comfortable yet supportive. Front and back passengers have good head and leg room, and the steering adjusts to numerous positions for the driver’s comfort. The A6 is equipped with large lightweight doors that allow easy access to the vehicle for front and rear passengers. This Audi is capable of comfortably accommodating most passengers, even larger ones. The A6 is a large vehicle but it is easy to park despite its size. Parking sensors for the front and rear of the car may still be a wise investment. The A6 provides all the luxuries that have come to be expected from the executive class vehicles and more. This Audi will have no trouble competing with other name brand giants in its class. Good steering and other amenities make it an ideal car to drive for long distances. The cars sleek important look is also very appealing. The A6 might appeal to the family who needs to show up somewhere in class, but would not be very suitable for carpooling cheerleaders and the soccer team. The A6 is a sophisticated adult-oriented vehicle and is not designed to withstand the challenges that children present. Every first time car buyer would love to own the A6, but it is not really a practical car for new drivers. It is fairly large, extremely expensive to buy, not to mention maintenance and repairs would cost a fortune.The Audi brand carries great prestige, and the A6 will keep with tradition and further enhance that image. The A6 proudly displays Audi’s new nose and is the company’s new pride and joy. The A6 is equipped with several ant-theft devices. This includes an Interior ultrasonic protection system, an electronic transponder immobilizer, and an anti-tow away device. Thatcham Category One systems come standard on all models. There are several security upgrades available as well. The A6 design did not overlook safety. Some of the standard safety features include airbags, durable body composure, and a safety steering column. Safety enhancements are also available such as rear air bags, and a first aid kit. The Audi’s Multi Media Interface includes the stereo functions as well as the cars other electronic functions all displayed onto the same screen. At first glance this system seems too complex and overwhelming, but once the driver learns to navigate only the functions that will actually be used it becomes less intimidating. The standard MMI package includes a 6.5-inch display, CD player, and a DSP speaker sound system. Upgrades are also available. Audi offers 15 exterior paint colors for the A6. Metallic hues seem to fit the cars unique style and personality. The interior of the A6 is amazing with two different types of fabric upholstery, three different leathers, with aluminium, walnut, and beige birch. Audi has delivered a complete and comprehensive car. It is difficult to find any short-comings with the A6. The A6 is not economic on fuel and does offer a diesel version. However, if you can afford to buy an A6, then paying for the fuel should not pose a problem.